It’s toured to the Vail International Dance Festival, to the Joyce Theater in New York, and, this past summer, to dance mecca Jacob’s Pillow. Why is this work so in demand by prestigious venues? If you’re imagining an intriguing subject for a new ballet, a pilot’s flights between New Zealand and Hawaii might not be the first thing to come to mind. And yet Sunset, o639 Hours, the 2014 collaboration between choreographer Matthew Neenan and composer Rosie Langabeer, centered on Captain Edwin Musick’s first-ever round trip flight between Auckland and Honolulu, has become one of BalletX’s most popular works. It’s toured to the Vail International Dance Festival, to the Joyce Theater in New York, and, this past summer, to dance mecca Jacob’s Pillow. Why is this work so in demand by prestigious venues? Tara Keating, the company’s Associate Artistic Director who works closely with the dancers and in myriad ways supports and complements the work of Artistic & Executive Director Christine Cox, attributes this ballet’s success to the way all its elements come together. Neenan and New Zealander Langabeer developed a strong working relationship while making the Apollinaire-inspired Proliferation of the Imagination (2011). With music a frequent starting point for Neenan, Langabeer’s versatility was key—she, instrument inventor Neil Feather, and Langabeer’s band The Sunset Club, featuring musicians Andrew Mars, Joshua Machiz and Isaac Stanford, supplied everything here from airplane sound effects to a Maori singing circle to a posh nightclub act. The Sunset Club is woven into the stage picture as characters, making an especially rich synergy. Maiko Matsushima’s set elements are versatile too, suggesting clouds, floating bits in a watery world, or fragments of an airplane. The costumes by Christine Darch morph easily from elegant evening- to island-wear. And Drew Billiau’s lighting evokes scenes like a beach sunset and an underwater paradise. Together with Neenan’s expressive movement language, all the elements support the dreamy telling of this combination adventure/love story. Keating calls it “magical” and likens experiencing Sunset, o639 Hours to going on a journey. Keating joined BalletX in its debut season while still a soloist at Pennsylvania Ballet. The vision of co-founders Cox and Neenan—to focus on new works—held great appeal for her, especially as she began her third round of performing Swan Lake and Sleeping Beauty. Leaving PAB in 2007, she segued into full time work with BalletX, gradually taking on more artistic and managerial responsibility. 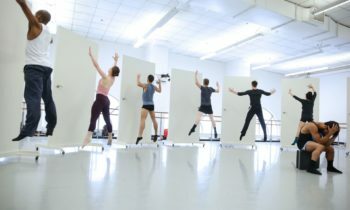 She retired as a dancer in 2012, but as Associate Artistic Director she’s the prime person in the studio with the dancers when restaging an existing work. “The video becomes my best friend,” she says. To be able to show the movement as much as possible she learns all the roles. For Sunset it helped that when it was revived in 2015, seven of the ten dancers already knew the work, so they could demonstrate moves that were especially tricky.